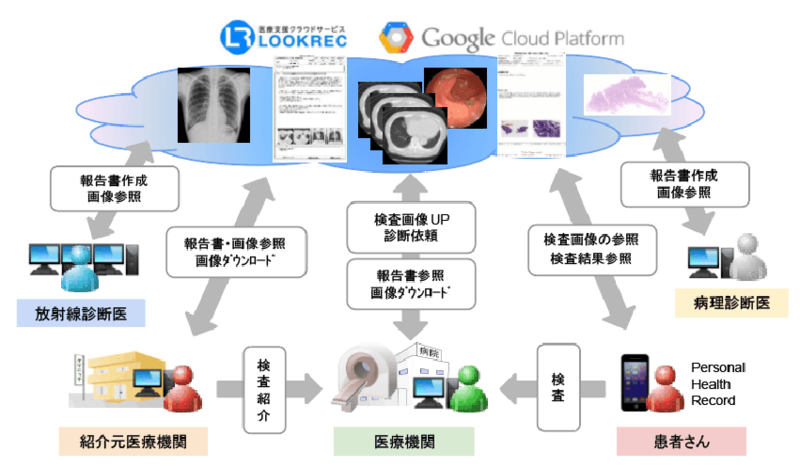 LOOKREC is a cloud-based medical support service for medical institutions and individual patients with a key focus on inspection image sharing. 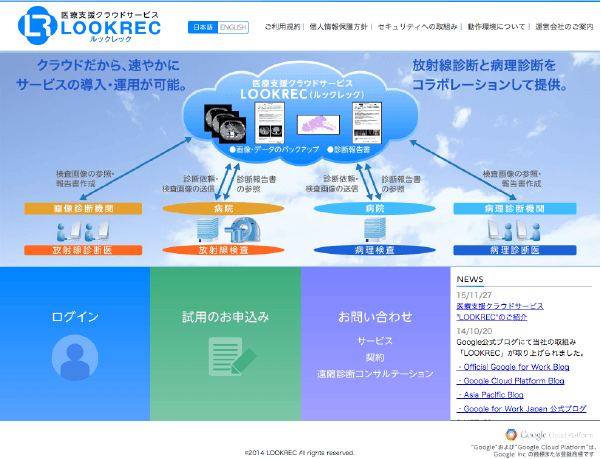 Built on the world’s leading cloud platform “Google Cloud Platform,” LOOKREC boasts a high level of security and availability that enable us to flexibly provide our services worldwide. Inspection images and diagnostic reports can be viewed in Google Chrome* anytime, anywhere. By collaborating with local medical institutions through the LOOKREC network, you can easily share medical data with them at a lower price. Our teleradiology service also helps ensure a high-quality medical service. LOOKREC can be used immediately with a minimum initial cost and a low monthly fee. It also contributes to a significant reduction of costs incurred to maintain the storage of medical data and back them up. Your data will be encrypted and stored dispersedly in several data centers to secure your business continuity. We are planning to further expand the scope of the service to respond to blood exam results, eye fundus images, medication information, and endoscope images. Since inspection images and diagnostic reports as well as patients’ health records can be managed and used on the cloud, patients do not need to carry around or store CDs, DVDs, and films of their medical records. In the case of emergency, while traveling, or when seeking a second opinion, patients can disclose their medical data to another medical institution, thereby being able to promptly receive appropriate medical treatment according to the past course of treatment. © Medical Network Systems MNES Inc.